The weight loss company fell on a weak earnings report, continuing its recent slump. Shares of Weight Watchers International, Inc. (NASDAQ:WTW) took a dive last month, falling 12%, according to data from S&P Global Market Intelligence. As the chart below shows, it was an up-and-down month for the weight loss specialist, and one that included a weaker-than-expected second-quarter report. Weight Watchers has had a volatile year, popping with news of a partnership with Oprah Winfrey that was announced in October 2015, but then slumping. Analysts were disappointed by revenue growth in its most recent report as the top line was flat at $309.8 million, missing expectations of 3% growth to $318.3 million. The stock fell as much as 13.5% the day of the report, but recovered most of its losses by the end of the day and even recovered in full by the following session. Other signs were positive as North America saw a 9% increase in paid subscribers and a 5% uptick in revenue. Global subscribers were up 5% year over year. CEO Jim Chambers said the quarter was the company's third in a row of member growth, calling this an encouraging sign for growth into 2017. Net income grew in the quarter, but earnings per share actually fell due to share dilution. Weight Watchers is one of the most heavily shorted stocks on the market, with nearly 75% of the outstanding stock sold short. 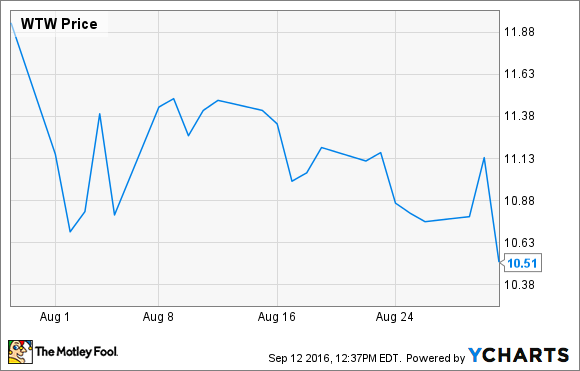 Those negative bets seemed to weigh on the stock for the duration of the month as it fell 6% on Aug. 31 on little news. The stock has slumped since it surged past $25 when Winfrey became an investor and strategic partner, and earnings have been falling for several years. While the recent increase in subscribers is a positive, the lack of revenue growth and decline in EPS are signs that even growth in the underlying business after Winfrey's entry isn't enough to stimulate the bottom line. With its volatility, heavy short interest, and lack of profitable growth, this stock just looks too risky to justify an investment.